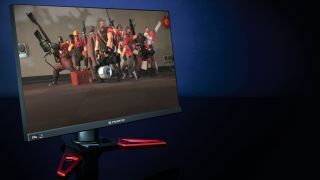 There's a tiny problem with PC gaming: once you've emptied your bank account on graphics cards, SSDs and luxurious 4K screens, it's likely you won't have much left in the way of funds for the games themselves. But never fear. Valve's excellent distribution platform, Steam, is packed with free gems to keep you entertained until pay day. We've selected five of the best in arbitrary genres, with additional recommendations if our favourites have piqued your interest. You can always head over to the Steam store (store.steampowered.com) and check out the 'free to play' category for more. Or save a few pennies to invest in one of the bargains contained in the regular Steam sales. Happy playing! Cookie Clicker has a lot to answer for. The utterly pointless web game that sucked almost as much productivity from the world's workers as Google's infamous Pac-Man doodle has spawned so many imitators that 'clicker' is now basically a genre of its own. Clicker Heroes leads the way by hitting all the right notes: it's initially about clicking silly monsters to kill them, and like its inspiration it doesn't stay that way for long. Once you've bought and upgraded enough of its autoclicking heroes to the point where you're able to ascend (restart), you get additional powers, upgrade choices, a trip down the rabbit hole of mathematical min-maxing, and you're off to do it all again. That doesn't sound like fun because, frankly, it isn't. What it is is compelling. Something to run on your second screen while you work. Clicker Heroes' repeated push sees you plough through its levels feeling noticeably stronger and tougher each time, and actually interacting with it is always completely optional. Yes, it stretches the definition of 'game', but it'll keep you involved for longer than many AAA titles. Game of the moment Overwatch would probably still be a twinkle in its developer's eye if Valve's Team Fortress 2 hadn't so excellently laid the groundwork for role-based multiplayer shooters. Forget the fact that it's now nearing its ninth birthday: TF2 remains a brilliant game, entirely free to get into with a thriving community and continued support to this day. You start by picking your role: the monstrous sandwich-fan Heavy; the slightly sinister Medic; the cheeky bat-wielding Scout; the… you get the idea. Then you join a team and complete a goal – usually capturing territory or escorting a thing, hindering or destroying your opposition as you go. TF2's charm comes from its sense of humour, clever level design and frantic, tactical first-person shooting – it tends to be a lot more fun than many of its po-faced rivals. Yes, certain content is trapped behind moderate paywalls, and you'll probably end up getting over-involved in making microtransactions for hats and other character upgrades. But we don't see TF2 going away any time soon, and we certainly don't see any reason not to give it a try. How could we not pick Dota 2 for this spot? Valve's own Multiplayer Online Battle Arena consistently tops the charts of Steam's most played games, and you can get involved without paying a penny. That is as long as you're okay with sticking with a rotating roster of selectable characters and the sort of steep learning curve that's made it a multi-million-dollar e-sport. Oh, and the community. Put a step wrong and you'll hear about it. On the surface, though, Dota isn't a difficult game to play. There's a whole lot to master – grasping the intricacies of individual characters' powers, for instance – but actually playing it is a case of joining one of two teams of five, heading into one of its many maps, picking one of (usually) three lanes and clicking like crazy. There's no doubt that climbing the ladder of Dota can be a terribly long-winded and harrowing experience, but playing casually, especially if you're with the right friends, is just brilliant. Like many massively multiplayer games, WildStar began as a pay-to-play experience and, as user numbers diminished, dropped to free-to-play with microtransactions. That's the worrying news. The reality is much happier: WildStar didn't lose numbers because it was rubbish, but because that's what happens to MMOs in general. It's actually rather good, a riotously enjoyable comic sci-fi experience that's packed with charm, and those microtransactions are as optional as they come: everything in the cash shop can be earned through playing the game. Perhaps the best thing about WildStar is its very real sense of community, bolstered by a super-neat building system which allows you to construct your own custom homestead. Or perhaps the best thing is the combat, fluid and skilful and just plain fun as it is. Or perhaps the best thing is the 2,000 hours of gameplay to lose yourself in. Or the fact that it almost feels like the early days of World of Warcraft. Or any number of other things. Although its comic-book style might not sit too comfortably in the predominantly-fantasy world of MMOs, and your guild is probably going to need some convincing to move if you're already ensconced in one of its competitors, WildStar is worth your time. Card gaming and tabletop gaming go hand in hand, but the means to gather a group of willing players around an actual dining table is not always within our grasp. Card Hunter doesn't offer quite the same experience as stocking up on sticky drinks and dusty crisps for a real get-together, but some might say it's better: a blend of humour, single-player progression, solid PVP and immense depth cradled in a cardboard shell, with no risk of smelly or obnoxious guests. The tactical board-based combat is highly reminiscent of D&D and, while bits of it are virtually off-limits if you don't invest at least a bit of cash to grab appropriately meaty equipment, the initial few hours are highly enjoyable. By the time you're through that early burst, you may be in the mood to chuck in some currency anyway.